With the ever-increasing kva capacity of power systems, the possible short circuit currents are becoming so high that it is frequently necessary to consider the effect of these short circuits on the heating of the cables. The conductor size must be large enough to carry the short circuit current for a sufficient length of time to permit the circuit breakers to open before the conductor is heated to the point where it damages the insulation. The chart at right shows the maximum currents to which various size copper conductors can be subjected for various times without injuring the insulation. It is based on a 90°C conductor operating temperature. 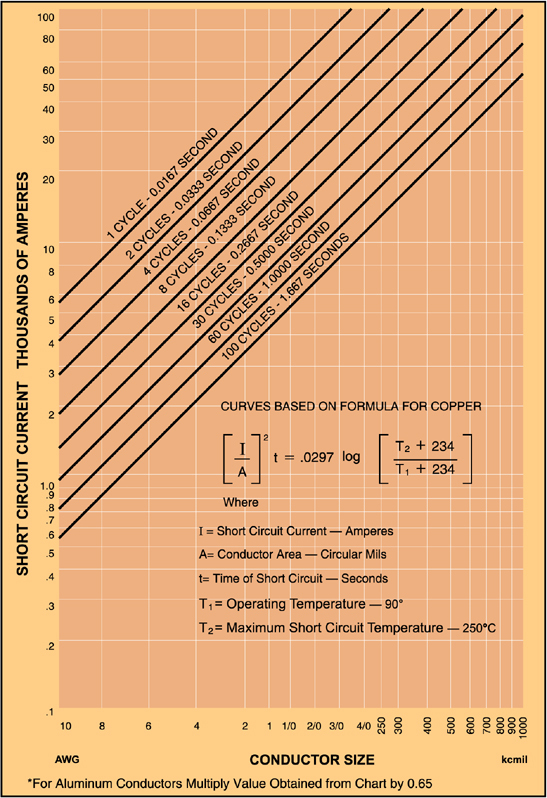 The maximum current for short circuit ratings for 75°C conductor temperatures and for other than 250°C may be obtained by multiplying the value obtained for T1 = 90°C and T2 = 250°C from chart by appropriate correction factor for other values of T1 and T2.